Newsletter #12 – Spring is Coming! 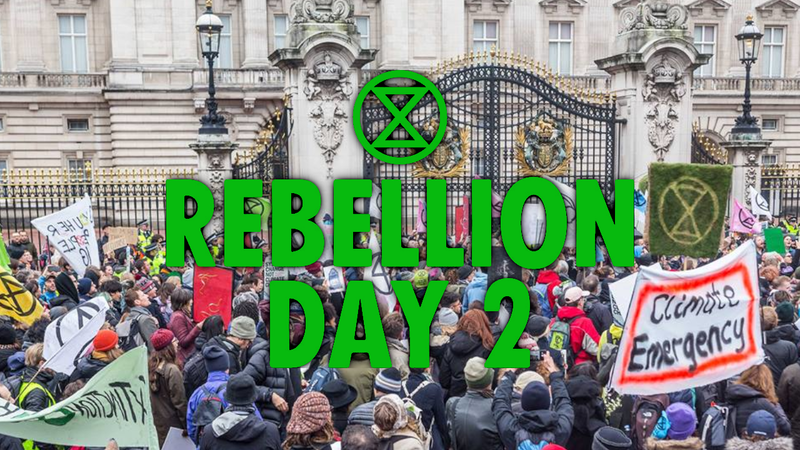 Welcome to the 12th Extinction Rebellion newsletter! January, and with it the process of root-growth and foundation-laying, is coming to an end. As we move into February we’re getting ready to start an exciting new chapter for XR which will see a return to high-profile public actions in the build-up to our International Rebellion in April. The meta-strategy review process is set to conclude in the next few days and will inform plans for national weeks of action set to take place in late February and late March. In the meantime, rebels won’t be short of things to do. Street parties, event-swarming, and much more are coming up in February (see Upcoming Activity below), not to mention the many regional and solidarity actions which we haven’t even had the time to keep up with! If you’d like to get involved with making it all happen please see our newly refurbished volunteers page for available roles or get in touch with your nearest XR group. Check out what’s on near you with our full list of upcoming events, available to view on our website, rebellion.earth/events. If you’re new, or have not already seen it, remember to check out our Campaign Overview Document. If you’d like to look back through the newsletter archive, you can find it here. After many meetings, a weekend-long feedback session in Stroud, more meetings, a national feedback-session in London, and plenty of online feedback, the Strategy Team is now just a few days away from announcing the overall XR Spring Strategy. Major action in April is guaranteed, but the final strategy document will address questions of what, how, when, and where, along with finer points of tone and nuance. For more details on the strategy process please see the latest internal newsletter. If you’re struggling to keep up with internal developments in XR you might be pleased to see that the Mandates Team has drawn a beautiful map of the various Working Groups and sub-groups. XR Scotland kicked off the Rebellion with a creative action on January 25th, otherwise known as Burns Day. Forty Rebels posed as tourists taking a tour of Holyrood, the devolved Scottish Parliament in Edinburgh, before occupying the debating Chamber for over an hour. Holding a symbolic Citizens Assembly in the Chamber, the group discussed the climate and ecological emergency and drew attention to the urgent need for a response from the Scottish Government which would be commensurate with the scale of the problem. No arrests were made, instead the Rebels were peacefully escorted from the Chamber by police through a side entrance to the building where they were greeted by hundreds of supporters cheering and applauding the action. The Scottish Rebellion has now been organising for several weeks and the occupation of the chamber in Holyrood was an excellent kickoff to future peaceful and impactful action. 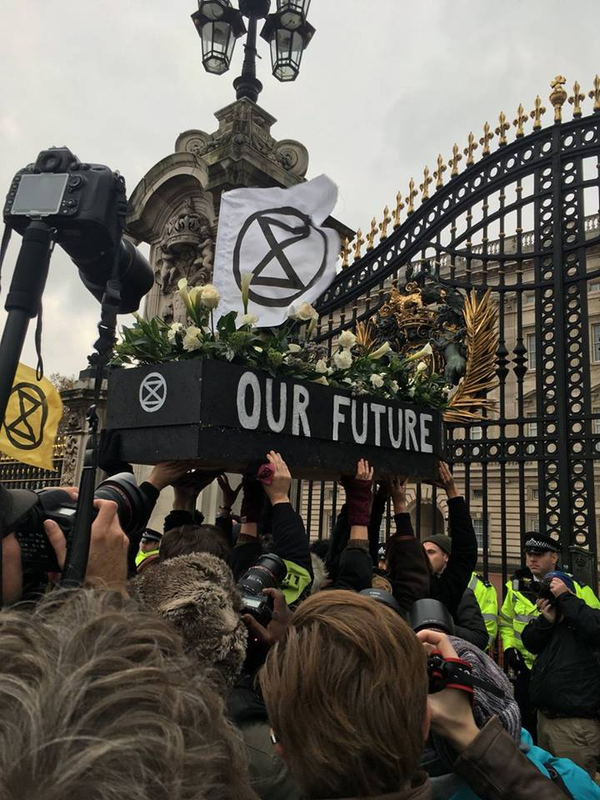 On January 15th Extinction Rebellion joined fellow campaigners in Parliament Square for the launch of Earth Strike, a new movement aligned with XR’s motives and methods. Earth Strike is calling for a globally coordinated international general strike to protest against every national government’s criminal failure on climate action. This also happened to be the day that the Members of Parliament were voting on Theresa May’s Brexit deal, so the square was already crowded with Brexiters and pro-E.U. supporters. 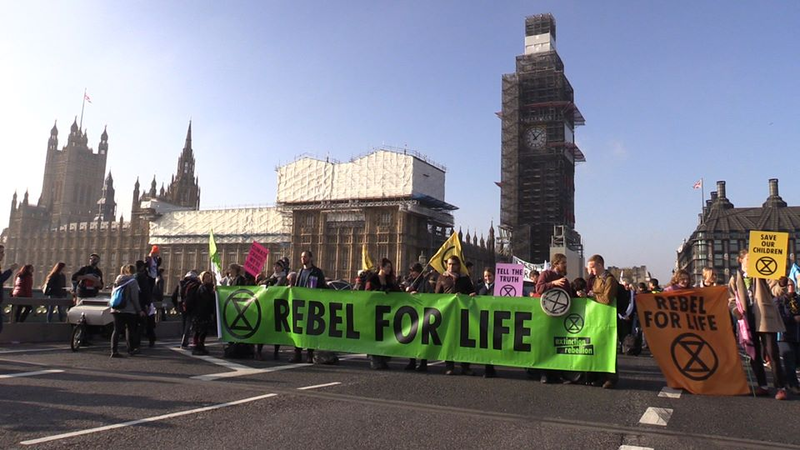 Extinction Rebellion members led an impromptu march of civil disobedience around Parliament Square, marching past parliament and blocking traffic. They chanted the words: “No Brexit on a dead planet! No E.U. on a dead planet!”, underscoring the irrelevance of the media-consuming Brexit saga in the face of the global climate emergency. Reactions ranged from the completely bewildered to the highly supportive and proceedings concluded with spontaneous singing and dancing in Parliament Square. Three XR UK NVDA Trainers recently instructed fourteen budding Rebels in Germany. Having only started at the end of November in the wake of the London actions, XR Germany already has an impressive twenty-one groups set up across the country. 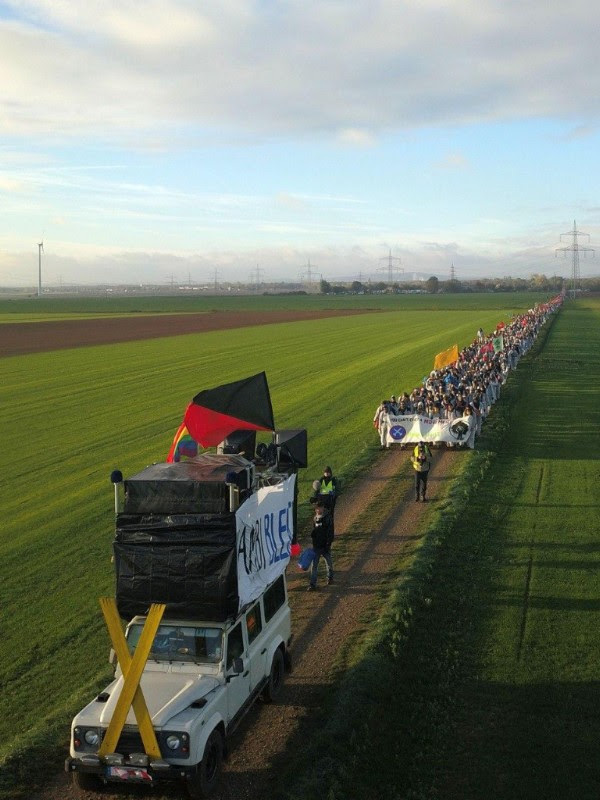 The three-day training, co-hosted by Skills4Action, an organization which has trained activists in direct action for over ten years, hosted attendees from cities across Germany. 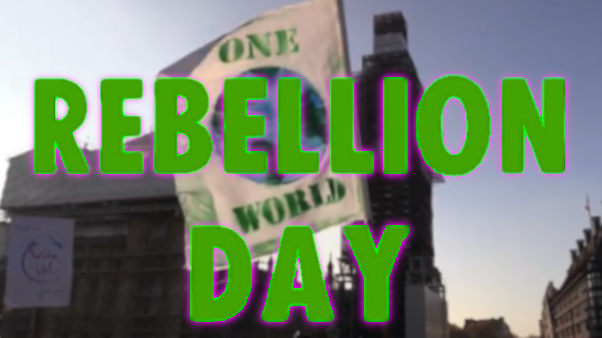 Actions are already taking place on the February 3rd with plans being made for April 15th – International Rebellion Day. We’re looking forward to working increasingly with XR groups in Germany and across the world. Sharing skills and building communities is how we will win. On January 24th XR joined Korean civil society groups alongside other UK activists outside the Korean embassy in a show of solidarity against an expanding coal industry in East Asia. The South Korean Government is one of the top coal power financiers in the world. Financial institutions controlled by the Korean Government are funding huge new coal plants in Vietnam and Indonesia. Despite the Paris Agreement, the objections made by local communities, and President Moon Jae-In’s promises, coal is thriving in Korea. The protest lasted several hours, and gained coverage from various Korean news networks. A community group, including members from XR Stroud, are taking Gloucestershire County Council to court over the award of a £600m incinerator contract. XR Rebels blocked access to the incinerator early in the morning on January 11th. They also recently spoke up in a Stroud District Council budget meeting. Extinction Rebellion Cambridge confronted Cambridge University stating that it is time the University stops investing in and working with fossil fuel companies as well as the banks that fund them. 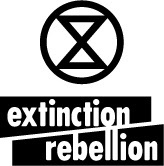 XR Groups around the country are continuing to hold weekly meetings, climate cafés, and talks on such subjects as ‘Heading for Extinction and What To Do About It.’ Find your local group and see how you can get involved! Extinction Rebellion is throwing a street party in Hackney on Saturday, February 9th, and we would love any Londoners to join us. It will be the first in a series of Saturday Street Parties which will give a platform to local groups to discuss environmental causes that affect their area. Extinction Rebellion exists to directly address the government’s inaction in the face of global climate and ecological collapse. The day will be centred around addressing local issues within this broader narrative. The week after the action we will hold one of our ‘Heading for Extinction and What To Do About It’ talks (Monday February 11th, at SET, Dalston Lane, London E8 3DF, time TBD) and will discuss the realities of climate breakdown and the impending sixth mass extinction event. The Street Party itself will serve as a community-building exercise. We want to bring people together in an act of lighthearted, low-level civil disobedience, with a variety of musical performances interspersed with brief discussion of environmental issues. Building strong and sustainable community groups will be the basis of this movement. Reaching out to local London communities is the priority of the Street Party and we will emulate the positive change we want to see through our actions. Come join us in Hackney and help inspire the area to stand up for the environment. See event page for details. The week after the first of these Saturday Street Parties is slated to get going in London, XR Bristol will be hosting their first event to reclaim the streets of Bristol in a family-friendly atmosphere. The event will take place on Saturday, February 14th, starting at 1pm, and will be part of a wider day of action. These actions will help set the stage for our International Rebellion in April, where thousands will occupy the streets. We hope to see many more participants in the build-up to the big day! The fashion industry is one of the most culturally influential industries in the world. It is also one of the most polluting and is deeply reliant on agriculture and petrochemical products. It applauds our unsustainable lifestyles and the toxic pace of our waste culture; we should no longer be impressed or enthralled by this. Is fashion out of fashion? This “business-as-usual” industry is stuck in a tired routine. Couldn’t it be done better, with something other than consumption at its heart? All cultures need to collectively wrap their heads around the crisis we are in and end business-as-usual. It is time to use the public influence of the fashion industry to build momentum towards this movement of civil disobedience and our International Week of Rebellion in April. With service and love in our hearts we will disrupt Fashion Week. We will swarm the streets, slow down those racing between shows, and spread the message of Extinction Rebellion. Join us. Youth engagement with the climate and ecological emergency is taking off around the world. In the last week we’ve seen 30,000 students across Europe protest by skipping school following the lead set by Greta Thunberg. In Berlin alone, 35,000 took to the streets to demand agricultural revolution. Children and parents from across the UK will be joining this wave of protest on the February 15th with fourteen locations listed so far and more still to come. This is not an official XR event but we encourage anyone who cares about the future of our children to participate. You know it’s coming – but do you know if you are? The International Rebellion beginning on April 15th has the potential to be a pivotal moment in world history – we’ll need as many people as possible to be present on the streets and helping to organise. Book time off work – ideally the whole week from the 15th – and share the event on Facebook to make sure that we can bring as many people as possible to participate in what could be humanity’s last and best chance to avert catastrophic damage to the planet. Without a doubt one of the biggest highlights from around the world this week was the beginning of the Rebellion in the United States. On Saturday, January 26th, a large black banner emblazoned with the words ‘Climate Change = Mass Murder, Rebel for Life’ was draped over the famous golden statue of Prometheus at the Rockefeller Center Ice Rink. As dozens of people held signs aloft the rink was taken over with several Rebels staging a die-in in the shape of the Extinction Rebellion symbol. Police had followed hundreds of protesters as they marched from Columbus Circle in New York to Rockefeller Plaza where Fifth Avenue was shut down for a period of at least twenty minutes. Nine were arrested and released five hours later. The message was indeed shouted from the rooftops of many American cities on Saturday. 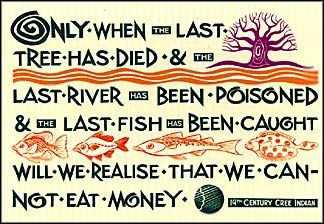 A banner with the same message as that in Rockefeller Center was lowered from a bridge in Los Angeles and demonstrations also took place in Washington D.C., Seattle, Chicago, the San Francisco Bay area, the Twin Cities, Philadelphia, Austin, Kentucky, and Denver. For further coverage of the action see the article in Rolling Stone Magazine. See more photos of actions across the USA here. The fundraising team is thrilled to present our new crowdfunder for the International Week of Rebellion commencing April 15th. We would also like to share this introduction to fundraising as a local group. The fundraising team has ambitious targets to support the forthcoming rebellious events and activities. We need any helpers who can seek out and contact potential donors and can manage our ongoing relationships and partnerships. Please contact xr.fundraising@gmail.com if you can spare some time and tenacity! Central to XR non-violent direct action campaigns is the willingness shown by some of those involved to face arrest, criminal charges, court hearings, fines, and possible imprisonment. The legal process is therefore very much a part of XR’s campaigning and many of our defendants are willing to use their hearings in court as a way of publicising the reasons why they decided to act as they did. They may, for instance, issue a ‘defence statement’ for publication, give interviews, etc. Other XR activists can get involved. Court hearings often start at 9:30 am but may continue for the entirety of a day. One way of demonstrating support for our defendants on the day of their trial is to be outside of the courthouse together between 9:00 and 9:30 am. It is also sometimes possible for supporters to attend the public gallery during the trial proceedings. We will soon be publishing lists of those trial dates and the times during which the defendants have given their consent for this to happen. XR Blog is always looking for more content. We would love to hear from you, including, but not limited to, diaries from XR actions, science-based pieces on ecological breakdown, political pieces on citizens’ assemblies, or analyses of the toxic mainstream media. 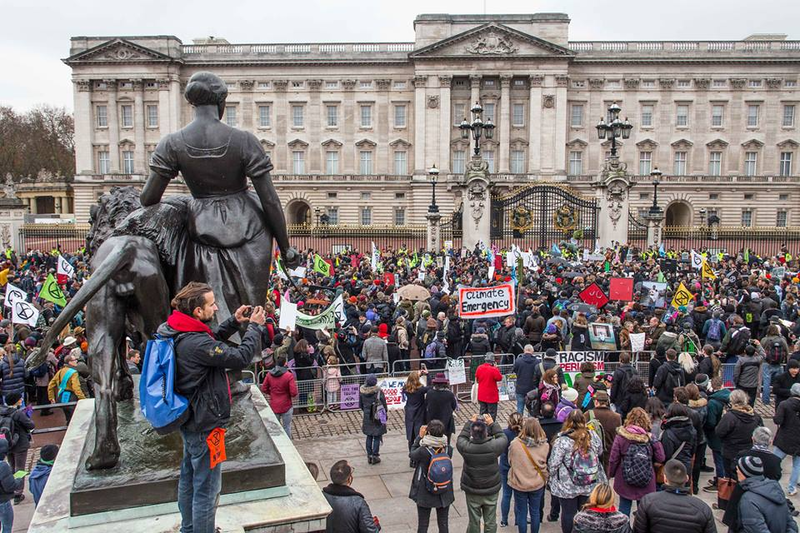 XR Blog is a democratic platform for all ‘voices of the rebellion’ – and that means you! We are happy to receive submissions from experienced and inexperienced writers alike. Additionally we are excited to announce some regular features, new for 2019. Firstly, we have ‘Affinity Group Stories‘ – we would like to hear about the journeys of affinity groups, beginning with their formation, through training and action, all the way to arrest, detention, and trial. We would love accounts from people of diverse backgrounds within AG’s. Please write in with your AG Stories. Secondly, there is the ‘Children of XR‘ feature – we are already in touch with some great young people who have spoken at XR events and have engaged in campaigns related to XR. This feature will be a regular bundle of news from young people around the world who are based in XR and related movements, particularly the Strike on Fridays movement associated with Greta Thunberg. Our third feature is ‘The Rise of the Right‘, tracking the relationship between ecological breakdown and resource scarcity with the rise of right-wing populist governments around the world. Fourth, we are thrilled to announce our ‘XR Write-A-Long‘ feature, which will be an ongoing fiction piece written by all of you! Details to follow soon. The more localised the Rebellion is the more powerful it will become. In the International Support Team there is a focus on supporting national groups and their rebellious activities in order to be as effective as possible. At this stage of the Rebellion there is a lot of work to be done in assisting with the formation of new groups and supporting the national initiators as they recruit more group members and establish themselves as a viable national group. Please contact vejde@riseup.net if you think you can help. Please email us at XR Festivals at xrfestivals@gmail.com – many thanks in advance. A little further down the line we will also be looking for Rebels to help us deliver our movement-building work at these and several other festivals. More information to come soon. Across the globe Extinction Rebellion groups are persuading civic authorities to declare a State of Climate Emergency. Visit https://www.cedamia.org/global/ to find resources which will inspire you to get your local town or county council involved in this action. A critical mass of declared councils will put irresistible pressure on central governments. Extreme weather hit 60 million people in 2018, no part of the world spared (UN News). ‘Code Red’ – Australia is experiencing such high temperatures that bats are dropping from the trees. Menindee fish kill: another mass death on Darling River ‘worse than last time’: Australian Greens Senator Sarah Hanson-Young calls for a Royal Commission over water management in the Murray-Darling basin, as the mass fish kills pile up (twitter: https://twitter.com/sarahinthesen8/status/1090025384828055557). Hanson-Young claims that the mass deaths are the result of water mismanagement and global warming-induced drought. Greenpeace and Amnesty International unite in push for greater civil disobedience. This is a landmark conference in which two of the world’s largest non-governmental organizations have joined together in the fight against climate and ecological collapse. Also significantly, Extinction Rebellion is cited as one of the motivators for these two organisations to call for an increase in civil disobedience to push for the systemic change we need. Scotland could be net-zero for greenhouse gas emissions by 2045, according to a new report. Dahr Jamail’s latest Climate Disruption Dispatch: ‘We Are Destroying Our Life Support System’ – all of the latest horror stories plus an unexpectedly beautiful correspondence with Stan Rushworth near the bottom. The Transformative Power of Climate Truth: Ecological Awakening in the Trump Age, by Margaret Klein Salamon, Founder and Director of The Climate Mobilization. In this opinion piece in the Huffington Post, Sandrine Dixson-Declève and Anders Wijkman point the finger of blame at politicians and economists – the former for their delays and constant wrangling, and the latter for failing to acknowledge the severity of climate change – for the situation we now find ourselves in. Redacted Tonight interview: ‘Rebelling Against Human Extinction’ (video) with Rory Varrato – lots of great analysis and discussion of the XR movement and the potential for bringing it to the US. An excerpt from Dahr Jamail’s recent book, The End of Ice: Bearing Witness and Finding Meaning in the Path of Climate Disruption. A powerful urge to bear witness to the destruction of the planet as if we were attending to the deep sickness of a loved one; another writer giving up on hope and looking instead to grief and the necessity of action, regardless of the likelihood of success. Those who were moved or intrigued by last week’s recommendation of Rupert’s, ‘This civilisation is finished, so what is to be done?’ may be interested in a live lecture, in which Read presents a vision beyond the limited hopes of the Paris Agreement, presenting practical responses and inciting courage in us all. The lecture will be followed by a Q&A. Bonding and bridging in London’s poorest borough – George Monbiot writes on how the foundation Every One Every Day has improved the social life for residents in Barking and Dagenham by opening shops on the high streets for people to use as social hubs and “maker spaces”. From working kitchens and sharing tools to creches and chicken schools these spaces give locals hope for future generations. With the help of 200 volunteers St. Nick’s has been transformed from a landfill site into a nature reserve in the centre of York. The site is now used as a base from which projects and services are run to help the residents of York move towards a sustainable future. The project is now looking to recruit more volunteers. Germany is set to close all 84 coal-fired power plants and will rely primarily on renewable energy! Coal plants account for 40% of Germany’s electricity; over the next 19 years, Germany will be switching to renewable energy, which will provide between 65% and 80% of the country’s power by 2040. Thank you for reading this, our 12th newsletter. We’re super excited about the coming months and what they might hold. We’re also excited to welcome a whole host of new members into the newsletter team. We’re looking forward to our new writers bringing with them some fresh changes in style, tone and format – keep an eye out for changes and improvements in the coming issues! That said, the team is still far from full-capacity – if you’d like to get involved in helping put together future editions, join the newsletter hivemind by emailing xr-newsletter@protonmail.com. Get in touch with the same address if you have any questions or queries. This newsletter was written collaboratively by a hivemind of 9 rebels. As our eagle-eyed readers will have noticed in Announcements, we’re now raising funds with a brand new Fundrazr. The mechanism may be new but the facts remains the same; if we’re going to achieve our aims in April, we’ll need money to pay for arrestee support, transport and accommodation for protests, art materials, banners, fliers, personal expenses, etc. The scale of the Rebellion could be limited by the amount of money available. If you would like to support the Rebellion though other channels, a regular standing order would be perfect (as would one off donations). Standing orders or money transfers should be made to our Triodos Bank Account (Sort code: 16-58-10 Account No: 20737912) in the name of Compassionate Revolution Ltd (the holding company for Rising Up!). Any queries contact Dave Nicks (dave.nicks@btinternet.com). XR Newsletter Archive #11: Get ready for a green 2019! Happy 2019, and welcome to the 11th Extinction Rebellion Newsletter! We’re hitting the new year running, with an incredible number of events happening all over the country. The main theme for January will be the laying of foundations and preparing for the coming Eco Spring, as reflected in the many planning meetings happening regionally and nationally (see Upcoming Activity for more), together with a bumper crop of socials, training events and talks. That said, things won’t be too quiet on the actions front either: we’ve already seen several solidarity actions over the festive period (see Recent Activity), and are expecting many more between now and mid-February when we’ll be returning to the streets in (non-violent!) force. We’re also looking forward to rebellions in several major US cities at the end of this month – stay tuned! If you’d like to get involved in making it all happen, please see our newly refurbished volunteers page for available roles. Check out what’s on near you with our full list of upcoming events, available to view on our website, rebellion.earth/events. If you’re new, or haven’t already seen it, remember to check out our Campaign Overview Document. Let’s make 2019 go down in history as the year we, the people, changed the game on climate change! On the 28th of December, Extinction Rebellion joined Reclaim The Power to support the Phulbari Solidarity Group and disrupt the Annual General Meeting of Global Coal Mining Resources. The company has been trying since 2005 to begin work on an open pit coal mine in the Phulbari region of North West Bangladesh. By the company’s own admission, the project would immediately displace 40,000 people. Detailed reports of the project have shown that as many as, “220,000 people could be displaced over time as mining operations drain the water from wells and irrigation canals in the area.”FOOTNOTE: Footnote The project could pose a huge threat to some of the world’s largest Mangrove forests, the Sundarbans, listed as a Unesco world heritage site. “If the mine is built, it would lead to the forced displacement of up to 230,000 people over the 36 year life cycle of the project. It will increase poverty, water pollution and will plunder 14,600 hectares of Bangladesh’s most fertile and productive agricultural land in the region, causing a crisis of food production. It will have a devastating impact on the people and the environment. In return Bangladesh’s government would gain nothing but economic exploitation”, stated Dr Rumana Hashem of Phulbari Solidarity Group. The three Extinction Rebels who blocked the entrance to the building inside the lobby successfully stopped major shareholders, including GCM’s Head of Corporate Affairs Brian Mooney, from attending the AGM. After standing outside for over three hours with the rest of the Phulbari supporters chanting and singing, the shareholders gave up and decided to leave. The three arrestees were later removed by police, arrested for aggravated trespass, and charged with £4000 worth of damages. The Rebels were proud to have joined and supported the Phulbari people and will fight the charges with the support of all groups involved. For more info on the day please read the Phulbari Blog summary, or a personal account from XR’s Tim Jones. On January the 2nd a Rebel in Exeter started the year with a bang, spray painting a Barclays Bank with black powder paint, reading, “Frack Off! #XR”. He was arrested for criminal damage, with a court date to follow in January. Barclays Bank is notorious for its continued investments in a number of fossil fuels. In the UK, a subsidiary of Barclays Bank is the majority shareholder of Third Energy, a company pursuing multiple fracking operations in Lancashire. Every action we take helps this movement grow stronger, and draws further attention to the climate emergency. We are grateful to Matt, the Exeter Rebel, who was arrested for taking a stand against this twisted system that seeks financial reward in the destruction of our planet. With Love and Rage, the fight goes on. Last week, Extinction Rebels attended their first court dates in London and Manchester for actions they took as part of the November 2018 Rebellion. These preliminary hearings were the start of a process that will see the UK legal system seek to punish those brave people for actions they took to draw attention to the climate emergency, and force our government out of its inertia in the face of the sixth mass extinction that is underway. All of us here at XR cannot express enough our gratitude to these people who are dedicated to preserving this planet as it is. Thank you to all of those who have stood up and continue to stand up for climate justice! The vast majority of those arrested in November, including all those arrested on the bridges, are yet to hear anything about their arrests. We will keep you updated with any news on those who have been charged, and those still waiting to be. In 2018 Extinction Rebellion went from a handful of people planning in a room to some of the biggest acts civil disobedience in decades. It’s clear why – the climate and ecological crisis is beyond dire – and rebellion is now both necessary and justified. 1. Take the time to meet each other, and share our stories, hopes and fears. Understand what has brought us all to this point of action. Learn what we are all contributing around the country – this movement requires a lot of work, but we will get there by doing it together. 2. Inputting into the Strategy Process for how we are going to win in April this year. Core teams of XR have been working overtime to develop new ways of working, and coordinating our plans to bring together a dramatic series of mass civil disobedience events during the International Rebellion, starting from 15th April. You can ask any questions and feed ideas into the strategy process via small group discussions. 3. On Sunday we will hit the ground running with training on how to build our movement and learn the many skills which will make us both effective and humane in our plan for system change. More details will be posted on the event page in the coming days. Places may be limited so please book soon and bring new people from your local group or affinity group. Everyone is very welcome, whatever your background and relationship with Extinction Rebellion. If you need accommodation in London let us know at info@risingup.org.uk or xrtravel2018@gmail.com. We hope to have places to sleep – but if you can stay with friends then please do so! In 2019 we have to go from national movement to world transformation – our children’s future depends on it. This is our intention, and are planning for it. We look forward to seeing you on the 19th. Polly Higgins & Jojo Mehta of Mission LifeForce will be running this session for XR and other environmental activists wishing to represent themselves in a criminal court using the Freedom of Conscience argument (as a means to ensure the court hears why direct action has been taken). Entry is free; more info HERE. Venue to be confirmed once we have an idea of numbers, so please indicate your interest on the Facebook event page. The World’s Youth are waking up. Millions of young people are realising it’s now or never and are taking direct action in the face of the climate crisis and ecological catastrophe. Greta Thunberg’s pioneering school strikes in the lead-up to the Swedish elections last year, and every Friday since, have gained worldwide attention. Thousands of students have been doing the same in Australia. Whether you are at school, college or university, go on strike on Friday 15th February. For some this falls on half term; join the protest anyway, with youth from across the world. In November we planted the seeds of our Rebellion; over winter we’ve been spreading roots internationally and across the UK. As spring comes, these seeds will grow into a forest. On April 15th we are calling for a global week of Rebellion, with independent local XR groups taking to streets all over the country to demand decisive action on climate change and ecological collapse. In the meantime, we’ll be building up with weeks of action in mid-February and mid-March, and a Spring Gathering among many other events around the country. For now, we’re asking people to prepare by booking time off work for the week (or more!) following April the 15th. More details to come in due course. Please share this with everyone you know. We’ll see you on the streets then, rebels. As our movement grows, so too does the number of ways in which people can get involved and help us to achieve our vision of a sustainable future. For this reason, we’re excited to share this new section of the newsletter, where you’ll find requests and opportunities from people across XR. The most important thing to look at, if you haven’t already, is the volunteering page on our website. Here you’ll find a whole range of positions and roles with descriptions and the means of applying. It’s worth mentioning that the applications deadline for some of these is Friday 11th of January – so if you think you might be interested, go ahead and apply! Beyond this page, you’ll also find various requests and announcements below. Following the departure of a deeply valued member, and anticipating a much bigger and busier new year, the Newsletter team is currently looking for new members. We’re especially looking for people with experience in writing, editing/proofing, content-sourcing, and html-based design; though enthusiasm for any of these definitely counts! Time commitment can be as little as a few hours a week, and working remotely is very feasible. Please email xr-newsletter@protonmail.com if you’re interested. Hello all you lovely XR folk. We have just launched a subgroup of the core XR Regenerative Culture group for the UK under the title ‘Land Support Base and Open Homes’. In Regen we are grateful for all the positive and constructive feedback from the well-being support we have provided on actions. However, we are not resting on our organic laurels! It’s now time to start looking at a deeper embedded support for our activists and organisers in UK society, especially land-based society, as biodiversity, and connection to the land, are essential for human physical and mental health. We have lots of plans and intentions long-term, which everyone in XR is welcome to contribute to. For now, the practical focus is on building a spreadsheet of both land-based projects and ‘open homes’ (private homes) across the UK who are happy to provide respite, on a non-commercial basis, to those in XR who need it, be they organisers or front-line activists. Some basic respite training for hosts is in development and will be made available online. Arrangements with land-based projects may involve some XR members doing a little therapeutic physical work in return for board and food. (A bit like wwoofing, but with more emphasis on recuperation for the activists / less working hours). We are also seeking any land-based projects that can host events or trainings on a non-commercial or bartering / work exchange basis. Decentralisation of this strategy out to regional and local groups will happen ASAP. * Maybe you are already sorting out something like this for your local group or area? If you want to get in touch to coordinate with this wider strategy, please do. * The priority right now is to find people across the UK who are happy to be entered into our spreadsheet of land-based projects and open homes, so that in the lead-up to international rebellion April 15th, we already have a grounded UK network of hosts ready to accept people for rest and psychological prep before April actions. We are especially keen to facilitate city dwellers getting a break in the countryside. * We are also seeking committed XR folk to join this working subgroup in the capacity of contacting land-based projects and asking if they might be able to help. Significant time on data entry will then be required. If you can spare a few hours per week on an ongoing committed basis, let us know. We’re looking for an XR community space! It would be used in a variety of ways; for office and storage space, meeting and training rooms, socials/regen events and growing food (if there’s an outdoor area). Ideally, it will be in zone 1 or 2 and it should be easily accessible on public transport from central London. If you know of an empty building or one which is available to rent please send the details (address, owner, photos etc.) to xr-spaces@protonmail.com or perhaps you could organise an empty building search with some other XR members and let us know what you find! Please drop us an email if you want to get more involved in the project. Douglas: The first section is a brilliantly clear and incredibly worrying summary of the current climate crisis – the best such analysis I’ve read to date. This is followed by a consideration of what might happen in the very real possibility (now probability, in Read’s view) that we fail to face up to the challenge. Such speculation is certainly bleak, but instead of despair I found that Read’s framing provides all the more reason to fight even harder to save as much as we can of the world we love. Thanks for reading this, our 11th newsletter. We’ve got a really exciting few months ahead of us, and we’re looking forward to documenting as much as we can in future issues. Whether at a meeting room, on a street or in the cybersphere, we look forward to sharing with you our fight to save the planet! If you’d like to get involved in helping put together future editions, join the newsletter hivemind by emailing xr-newsletter@protonmail.com. This newsletter was written collaboratively by a hivemind of 5 rebels. 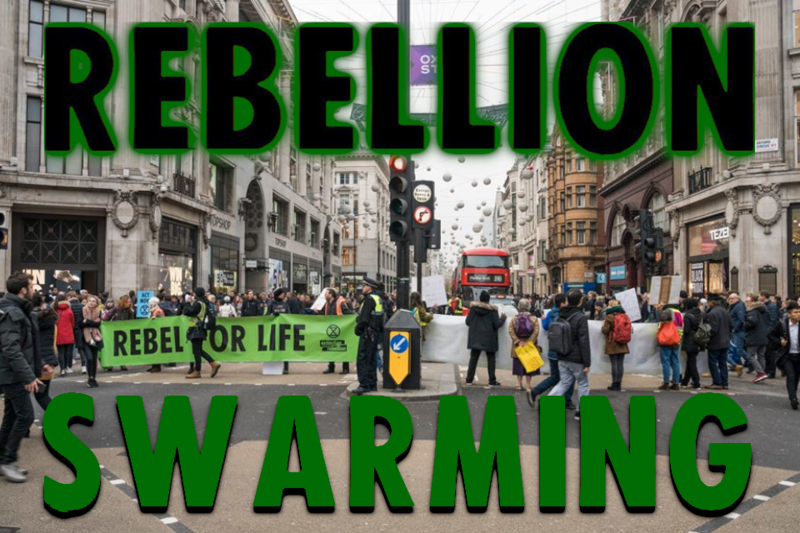 Welcome to the 10th Extinction Rebellion Newsletter! So far, over 160 brave rebels have been arrested for taking non violent direct action. The rebellion is continuing to take root and self-organise all over the world. Find your local XR group on the map, here. Check out what’s on near you with our full list of upcoming events, available to view on our website, rebellion.earth/events. If you’re new or haven’t already, remember to check out our Campaign Overview Document. Saturday 15th December – as Storm Deirdre battered the country, Extinction Rebels staged peaceful actions across the regions to raise the alarm on the ecological crisis, while pressuring local councils to; declare a Climate Emergency, go carbon neutral by 2025 and create Citizens’ Assemblies to facilitate this change. A map of all the towns and cities who have already declared climate emergency is being compiled, here. Actions took place in towns and cities across England including; Brighton, Newbury, Exeter, Bedford, Halifax, Totnes, Torpoint and Devonport, Swindon, Bath, Cambridge, Frome, Norwich, Truro and Preston New Road, where there was a solidarity visit to the anti-fracking protest camp, the day after an action in St Peter’s Square, Manchester. More than 250 rebels in Bristol sang subversive carols and gave speeches before marching on the city council. Some stopped on the way to chalk-spray the DEFRA building, and a tree was planted on the lawn outside the mayor’s office. Describing this tree as “the gift of life”, rebels urged the Mayor to implement strong measures after the City Council declared a climate emergency last month. Eight people were willingly arrested, allegedly for chalk spraying, including Bristol University’s Professor Colin Davis who said, “it felt good to be doing something”. With a few hundred people in attendance, starting at the Grafton Centre, Angela from Extinction Rebellion Cambridge stated: “We’re holding a die-in at two shopping centres, alongside three coffins, representing the current victims of climate change, the non-human victims of the ongoing mega-extinction, and the future victims still to come”. 100 people gathered in Glasgow. Anna, 24, said “We’re meeting to rally and sing subversive carols at the Buchanan Street steps, and we’ll be giving away trees to members of the public, after which we’re planning some thought-provoking disruption based around today’s Christmas shopping”. Actions were also scheduled for Inverness and Dundee, while XR activists in Fort William held their first meetings. Actions took place in Carmarthen and Cardiff, while the Llandudno event was postponed due to storm Deirdre. The same day, over 100 people showed up for Extinction Rebellion Nederlands’ Kick-Off Workshop in Hague. As the regions rebelled, around fifty rebels gathered in London to hold a debrief on the broader themes and developments within XR since Rebellion Day. With the help of five excellent facilitators trained in Processwork, the room periodically split up into smaller discussion groups before reconvening for general discussion. There were also physical exercises – in which participants came together to create human sculptures – and breaks for silent reflection. Though much was covered, the major themes of discussion were: ongoing efforts towards decentralisation, and how this might best be effected; similar questions about transparency (with frustrations voiced about insufficient progress in this area, and sympathetic responses citing the lack of time and resources to adapt as quickly as asked for); integration: how best to welcome new rebels into participation with XR; and the identification of a tension between a will to act quickly and preserve radical momentum, set against the desire to slow down and practice the mindful regeneration which we hope the movement is prefiguring for society. None of these discussions had simple or immediate answers; but perhaps the basis of a solution can be found in the very process which raised the questions, and the sincere engagement and discussion which characterised the day’s event. The mood was supportive but serious, with people voicing genuine concerns as well as heartwarming personal experiences, and a consistent emphasis placed on listening and democracy. The day ended with food, music, dancing, and a celebration of how far XR has already come; we’re looking forward to similar events in the new year! For more information on the development of XR moving forwards, please see our Extinction Regeneration Document. Extinction Rebels visited Katowice in Poland for the 24th annual UN conference on climate change, COP24. We did not go to engage with the political process, which we already know to be flawed but instead to build international links of solidarity, to put forward the case for non-violent civil disobedience, and to move the conference towards an emergency framing of the climate crisis. Whilst there, we gave talks, went on marches, held meetings, organised protests, and hosted press conferences. We also disrupted a speech by Claire Perry and held our own government to account over their destructive policies. We saw President Nasheed of the Maldives wearing our symbol on the conference floor and calling for “everybody to rise up”. Indeed, over the course of the fortnight, more and more insiders grew more and more impatient and, behind the scenes, rebels from all walks of life joined the movement. We returned from COP24 strengthened in our resolve to take XR global. The decision making of the political elite was predictably weak and reductive. In the face of their shortcomings, we find strength in our diverse, growing, and urgent movement. Check out; the hashtag, #DispatchFromCOP24 for more reports from Katowice. This interview with Democracy now, this street rally with XR presence and Greta Thunberg’s devastating speech to the UN plenary. On December 6th, the Greater London Assembly deliberated a motion by Caroline Russell (Green Party) that urged the Mayor “to declare a Climate Emergency, supported by specific emergency plans with the actions needed to make London carbon neutral by 2030”. The motion followed successful precedents set by councils in Bristol, Stroud, Totnes, Frome, Trafford and soon to be followed by Monmouth and Brighton (keep up to date here). Extinction Rebels were on site bright and early to welcome assembly members as they arrived for the plenary. Our presence outside City Hall was highlighted by Caroline Russell. In her summing up, she told the Assembly that “protesters are demonstrating … they’re just exasperated that we’re not taking these risks seriously”. The motion passed with minor amendments and early in December, Mayor Sadiq Khan declared a climate emergency, announced measures to protect people from the effects of climate change, and accused central government of “dragging its feet” on these issues. The BBC belongs to the people and retains its duty to present to the people the unbiased facts about the things that affect our lives. They have been remiss in this duty. The Climate Crisis is catastrophically affecting people all over the world. It is the issue of our time and the BBC’s reporting should reflect that. On the 21st December, XR will be demanding a new age of information: the BBC must lead in mobilising the nation against the greatest threat of our times. It must be a source of integrity in the face of climate emergency, as it was during WW2, when our lives were at stake, as they are now. Then, the BBC sounded a rallying cry for unity in the face of annihilation and it must do so again. We have time to affect the climate situation, but it won’t work without the media. The BBC belongs to the people, so let us remind its staff of that fact. The XR London will take action at BBC HQ, Portland Place, London, while rebels will also be gathering at regional BBC outlets in Manchester, Bristol, Sheffield, Cambridge, Birmingham, Glasgow, Truro, and hopefully even more than this. There will also be in action outside the BBC in Berlin! Organise in your local and regional groups, go to your local BBC offices with clear messaging about your demands. This will be our first action at the BBC. We’re disrupting production for a day, to highlight these vital issues, not to cause distress or offend BBC staff. So, we suggest sitting, lying down, singing, organising speakers and talking with BBC staff and the public about our message, all non-violently of course. The mission of the day is to educate and highlight with beauty, clarity and love, not to alienate or offend. For useful information, see our press release. If you can’t find the answer to your question from these documents, or from your local network, then please email: extinctionrebellion@risingup.org.uk for support with this action. 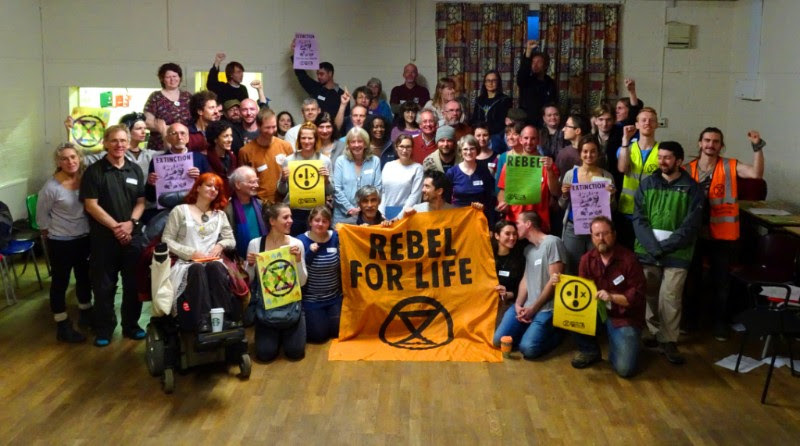 The UK’s Regional Day of Rebellion came as Extinction Rebellion New York held its first meeting in preparation for a National Day of Action in the USA, on 26th January, 2019. This will feature as a key part of the build up towards International Extinction Rebellion Week, which will start on the 15th April 2019, worldwide. In November, we planted the seeds of the rebellion in London. From those seeds we need a forest. The task ahead is monumental, and we must build strength to rise to the challenge. Through the winter, our roots have grown and spread throughout the UK and overseas. We will not disappear. We will not die off. We will not give in. Come the spring, regenerated, prepared, and ready, the rebellion’s first leaves will break through the soil and into the light. On April 15th we are calling for a global week of rebellion, with independent XR groups taking to the streets all over the world to demand decisive action on climate change and ecological collapse. More details to come in due time. For more information about our regeneration period and upcoming plans, please see the regeneration update on our website. We are in the process of setting up a network to connect Media & Messaging working groups across XR. There will be regular calls and a sharing group, where people can discuss media, messaging ideas and content. If you would like to be involved, please liaise with your local group and put forward a Media & Messaging rep. Send their name and email to pressxr@risingup.com. We’ll be in touch with more details. December 5th – 5 people were rescued from cars trapped by flooding in Carmarthenshire. December 7th – More flooding hit south and west Wales, closing roads and flooding homes. A man died after his car crashed on the M4. December 10th – Winter snowstorm Diego killed at least three people in N Carolina, left hundreds of thousands without power for days, and stranded hundreds of motorists in their cars. December 11th – Localised flooding caused widespread traffic disruption across B.C.’s South Coast. December 13th – Flash Flooding killed at least 13 people in Vietnam. 12,000 hectares of crops were destroyed and 160,000 animals were killed. More flash flooding trapped 100 motorists on the Hume freeway, Victoria. Floods hit Melbourne, Sydney, Ballarat and across Australia’s East Coast as Tropical Cyclone Owen approached. In the US, streets were closed by flooding in Charlestown. December 14th – Heavy rain collapsed an embankment, flooding a housing complex in Bekasi, Jakarta. December 15th – Storm Deirdre brought heavy snow, ‘freezing rain’ and gales to the UK, causing widespread disruption, road closures and left thousands without power across Scotland, Ireland and Wales. Roads were also flooded and trees uprooted in Plymouth, Dorchester, across Sussex, Cumbria where 9000 people were left without power and Devon & Cornwall where flooding temporarily closed the Eden project. The storm caused multiple car accidents around the country including 4 people who were hospitalised in a serious collision near Moffat. Antalya Province in Turkey was flooded after heavy rain, stranding motorists and pedestrians. December 16th -. A woman was rescued after driving into flood water in Florence, SC, where the water is 3ft high and still rising. At least one person was killed after being swept away by flash floods which swept away cars in Queensland, Australia, as a second front of severe weather followed in the wake of Cyclone Owen. A crocodile warning was issued after the large reptiles were spotted in the floodwaters. Parts of Semenyhi, Malaysia were struck by flash floods. December 17th – Almost 50% less rainfall during the northeast monsoon has led to drought affecting at least 120 out of the 176 talukas in Karnataka, India. The Met office issued another yellow warning for severe rain and possible flooding in the UK. Roads flooded across Cornwall. Fire crews were called to multiple homes flooded across Sussex. Severe weather slammed the East and West coasts of the US, causing high waves and flooding. December 18th – Extreme weather toppled 6 lorries on a P&O ferry between Scotland and Northern Ireland and ran a Russian cargo ship aground off the coast of Cornwall. 6000 homes without power in Ireland, where roads were flooded and trees uprooted. The river Ardle burst its banks in Perthshire, causing major flooding which closed a school and left roads impassable. A teenager was found dead two days after being swept away by flashflooding in Cha-uat district, Thailand. The mild inconvenience of the rebellion’s disruptions is as nothing compared to the unbridled fury of mother nature. Our thoughts are with all the victims of these catastrophes and their loved ones. These disasters are happening more frequently and getting worse. We are out of time. Severe drought in southeast Alaska, ordinarily one of the wettest locations in the US. The list of extreme weather caused by human-driven climate change grows. Insurance claims linked to global warming are set to surpass $15 billion this year. The Arctic Ocean has lost 95% of it’s oldest ice. There has been a 50% Hike of Record-Dry Months in Africa’s Sahel. India cancels plans for huge coal power stations as solar energy prices hit record low. The Stansted 15 have been convicted under anti-terrorism laws. Shadow Chancellor, John McDonnell has pledged to support oil and gas. Hungarians rally against slave law. Greta Thunberg’s full speech in front of the UN plenary at COP24. Trump’s Energy Advisor Runs Away When Questioned By Democracy Now! At COP24. Fracking halted in Lancashire (again) after largest earthquake so far. Two more arrests at Colne Valley after a #StopHS2 activist locked on to a bulldozer. 6th Gilets Jaunes have been killed in France. As we come to the end of the year, we’d like to give a massive thanks to everyone reading this for all your support; it’s been an amazing, exhilarating few months so far and we’re only just getting started. We wish you a regenerative Christmas period, and we look forward to making 2019 go down in history as the Year of Rebellion! This newsletter was written by a hivemind of 7 rebels. he’s invited you as well !